San Diego beaches are world-renowned — and for good reason. 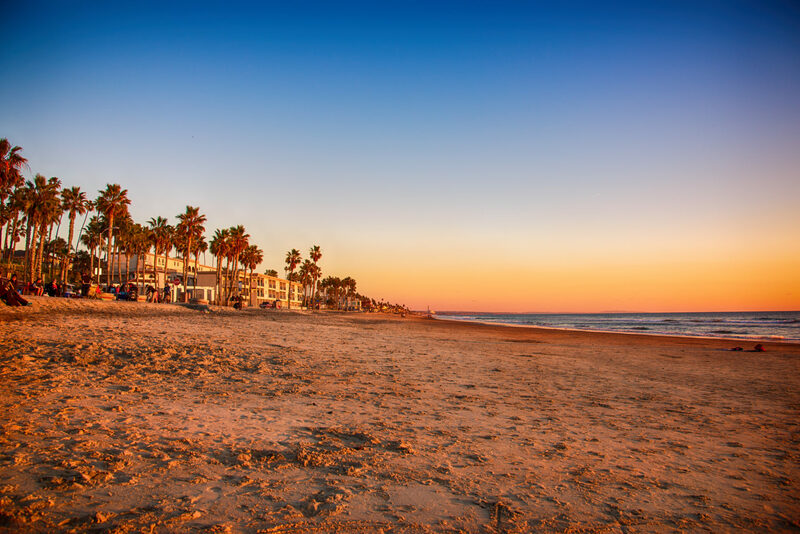 But if you prefer to steer clear of crowds and do as the locals do, you’ll find plenty of excellent lesser-known beaches that San Diegans love, with plenty of nearby haunts to hit after you’ve had your fill of sun. I grew up a half mile from the ocean, so spending five days a week at the beach every summer was routine. But after moving to New York a decade ago, I realized just how good San Diegans have it, thanks to their fantastic summer weather and miles of pristine public beaches. Tourists often flock to the most famous spots in the city, but my fondest memories are of sun-soaked days sitting on beaches in North County, where I would have the sand nearly to myself. 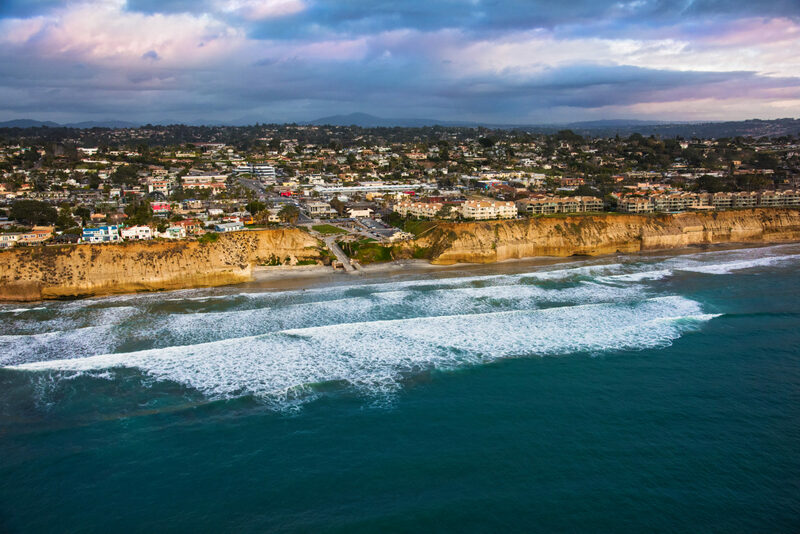 (Though San Diego proper extends only as far up as Del Mar, you’ll find plenty of charming beach communities in the county stretching north along the coast.) For a low-key beach day, check out these spots where you can commune with locals and discover a different side of San Diego. Moonlight is my favorite beach to visit when I go back home. Located two blocks off the main drag in Encinitas, it has it all: from a snack shack to fire pits to beach volleyball courts, where some of the best players in North County hone their skills in the summer. The beach can get busier on weekends, but you’ll never have trouble staking out a spot on the sand. (Parking, however, is another story. The lot can fill up quickly, but you should be able to find street parking in the surrounding neighborhood.) The beach also hosts a summer concert series, lots of surf schools and junior lifeguard programs. 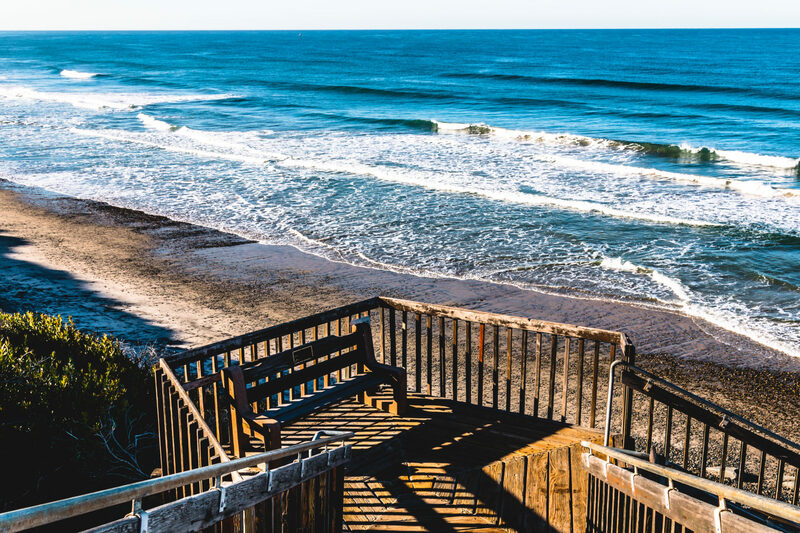 After you’ve had your fill of beach time, head up the hill to downtown Encinitas, a little surf town that looks seemingly unchanged since it was incorporated in the mid-1980s. 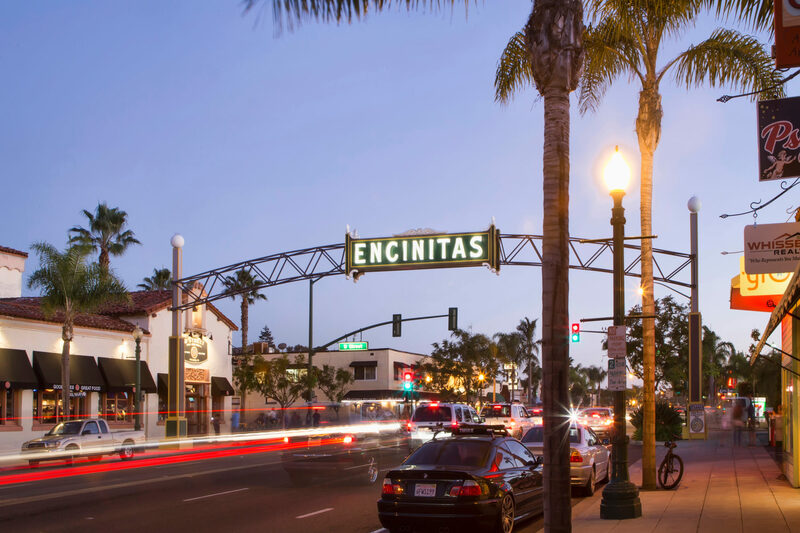 Drive under the charming Encinitas sign, which hangs over Coast Highway 101, and check out the sites, including the historic La Paloma Theater, a mainstay of the neighborhood since the early 20th century, and Swami’s Beach, one of the more celebrated surf breaks in San Diego County. Also worth a stop: Pannikin Coffee & Tea, a local coffee shop and roaster housed in an old Victorian train station. It’s a popular neighborhood meeting spot; during the course of an afternoon, you’ll see running groups stopping in for refreshment, cyclers taking off for a ride up the 101 and friends meeting to catch up. Pick up a cup of the excellent coffee and settle into one of the Adirondack chairs out front and relax. On the hill above Moonlight Beach, there are a few coveted parking spots at the end of a cul-de-sac outside the main parking lot entrance. Grab one at the end of the day and settle in to watch the sun set over the Pacific. 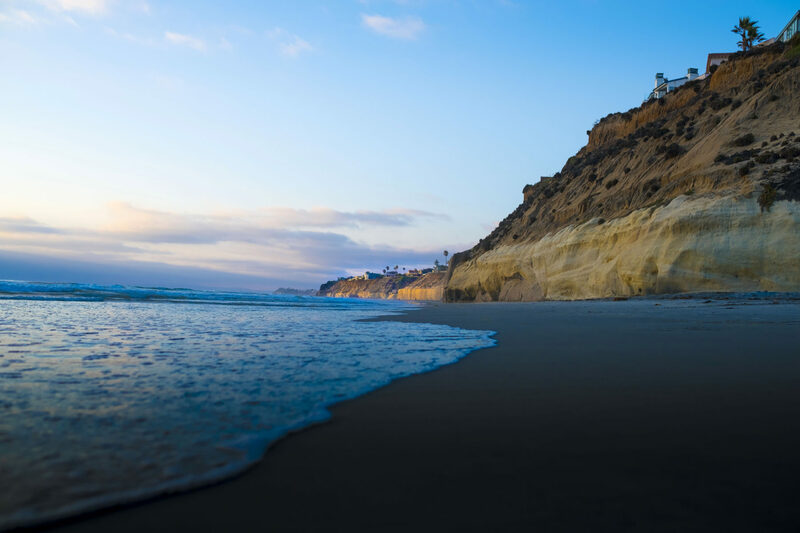 Fletcher Cove is located right in the heart of Solana Beach, the first town you’ll come to when you head north out of San Diego proper. This vibrant arts community features a stretch of restaurants, bars and concert venues all situated around Coast Highway 101. Park in the main beach lot and head down the hill to enjoy the protected cove, with its picnic tables, play area for kids, basketball courts and grass park. Fletcher Cove was my favorite place to hit the beach as a kid — I always thought the waves were a little calmer there and it was a perfect spot for novice boogie boarders. (The Dairy Queen up the hill didn’t hurt either. Another bonus? When much of Solana Beach’s shore is underwater during high tide, Fletcher Cove won’t be. At low tide, you can walk all the way north — to Tide Beach Park, a half mile away — and all the way south — to Del Mar’s North Beach, a mile away — without leaving the sand. Away from the beach, locals love exploring the nearby Cedros Arts District, a multi-block stretch of art galleries, boutiques and artists’ collectives just off the 101. You’ll find everything from vintage hats to funky shoes to home décor items and beach bric-a-brac. If you’ve worked up an appetite, grab a table at Pizza Port, a neighborhood mainstay since the late ’80s. Kids will love both the handmade pizza and the old-school arcade games; adults will enjoy the excellent beers brewed on site. San Diego is known for its west coast IPAs, so order a pint of Pizza Port’s popular Swami’s IPA. Once you visit this immaculate stretch of sand, you’ll wonder why the whole city doesn’t flock here. 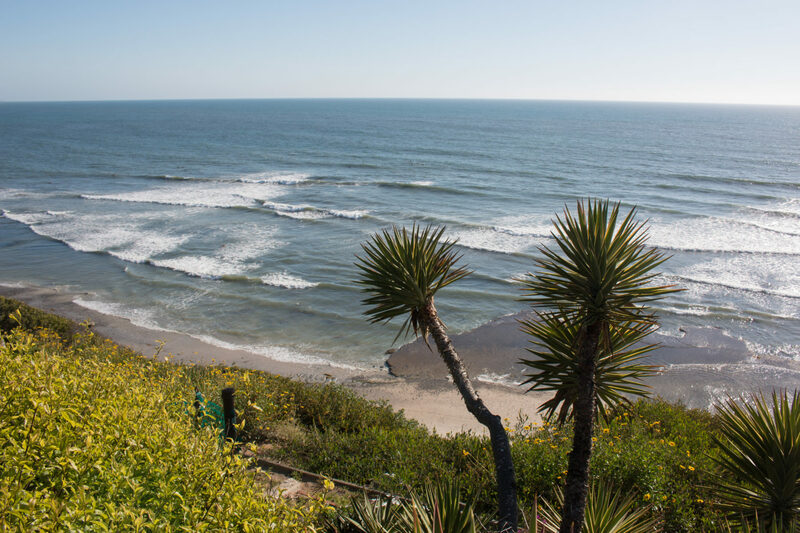 Located just north of Encinitas, South Carlsbad State Beach isn’t surrounded by much — just Highway 101 and the Batiquitos Lagoon on the other side of the road — but that means it stays uncrowded year round. (You’ll have plenty of room to set up your umbrellas.) The water here is as crystal-clear as any you’ll find in La Jolla. Plus, the lagoon inlet allows little ones to wade in the shallow, calm waters. For lunch, local favorite Leucadia Pizzeria will deliver to the beach — when you call to order, just let them know which lifeguard tower you’re nearest to. You’ll also find one of San Diego’s many In-N-Out burger locations nearby. Later, head into Carlsbad proper to hunt for deals at the popular Carlsbad Premium Outlets. For an even more laid-back experience, make your way to Ocean Beach. The quiet community is one of San Diego’s great surfing spots, but you’ll find something for everyone. Dog lovers can mingle at the northern end of the beach, where canines are allowed to run off-leash and crash into the waves. 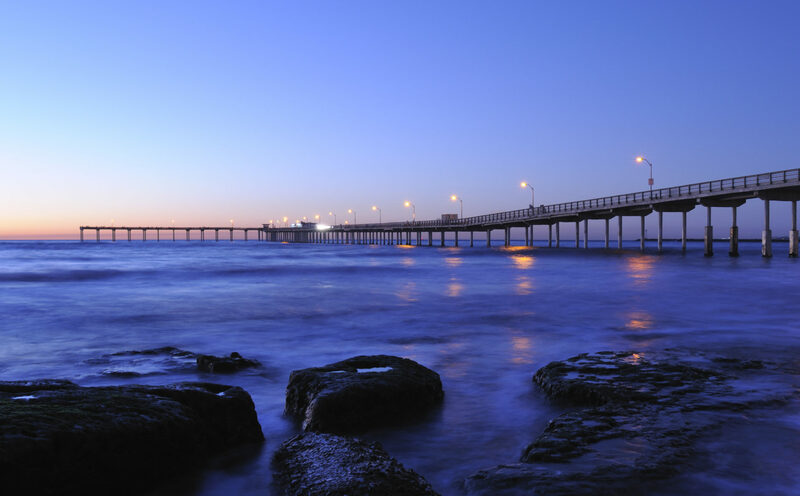 The local pier offers one of the only places in San Diego where you can fish without a license. Or you can head south of the pier at low tide to explore extensive tide pools — a fun activity for kids. Best described as groovy, OB (as the locals call it) is home to surf shops, vintage stores and restaurants — try the fish tacos at South Beach Bar and Grill. There’s also an excellent farmers’ market on Wednesdays. While you’re in the area, I recommend taking a drive to Sunset Cliffs Natural Park to check out the area’s intricately carved cliffs, bluffs, arches and sea caves. If you’re lucky, you’ll spot dolphins or a gray whale on its annual migration to Baja, California. At the end of the day, the best sunset spot is Cabrillo National Monument. The small park at the tip of Point Loma offers a historic lighthouse and breathtaking ocean views. 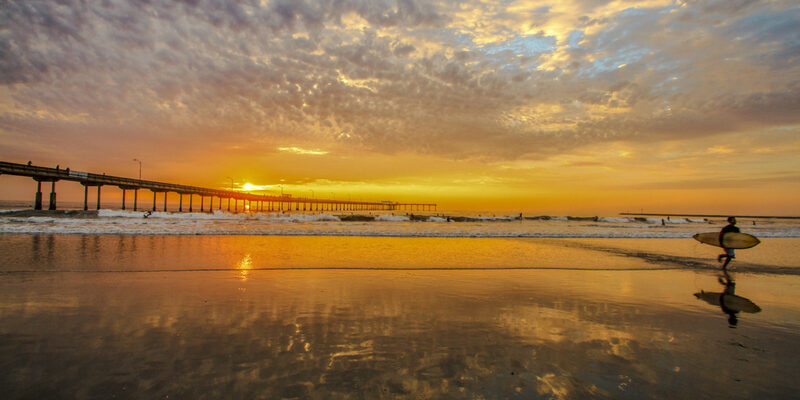 Oceanside is a hidden gem situated about 40 miles north of downtown. But don’t let the distance daunt you. The neighborhood overflows with character, from its old-school main drag lined with antique stores and shops selling beach cruisers, to the vibrant pier and amphitheater that hosts a slew of acts throughout the summer. The beach north of the pier is home to local surf competitions, but go south and you’ll find Harbor Beach, a popular white-sand stretch that hums with energy. Certain areas are closed off to surfing in the summer, making it much more hospitable for swimmers. But you’ll need to hike north of the pier if you’re looking for the best break. Après beach, bargain hunters will love checking out the weekly Lucky Street Market, an entire warehouse of vintage treasures and flea-market finds. Cap off your day with a stroll along the pier and a peanut butter cup milkshake at Ruby’s (a beloved local diner chain). Or head to Pacific 333, one of my family’s favorite places for sophisticated cocktails and fine seafood near the base of the pier. The oceanfront spot boasts an extensive raw bar menu and a great happy hour; I’m partial to the spicy pineapple martini paired with a plate of sweet-chili calamari. Whichever beach you choose, you’ll get an authentic taste of San Diego — and leave feeling that much more like a local.